Playwrite: CrawlNotes v2.0: The only dungeon planning tool a DM needs? 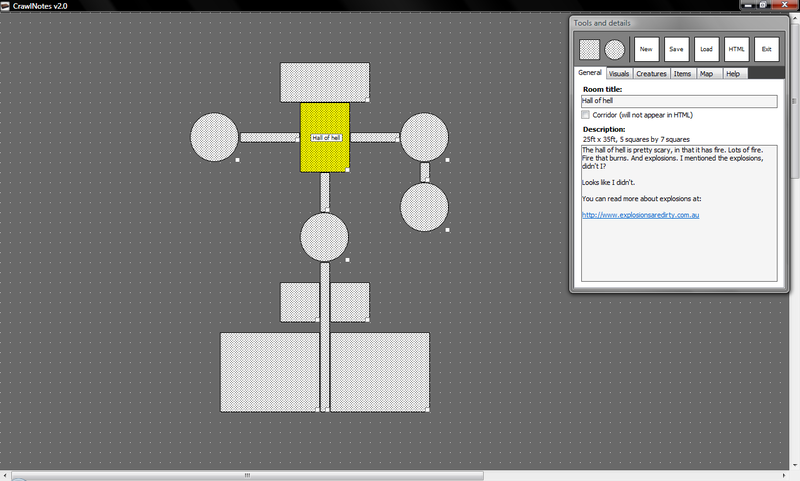 Drag, resize, pattern and colour rooms, and attach descriptions, monsters and items to them. Embed URLs to link quickly to information online (or locally), add levels to inject a bit of multi-dimensional flavour and, best of all, export it all to a nice, customisable HTML page with maps of each dungeon floor. A handsome (and big) screenshot can be found here. It’s crazy how much I’ve packed into version 2. It’s a rewrite, basically. Oval rooms join the plain old square ones and the resize function is less fiddly. The canvas performance is magnitudes faster, and there’s a semi-real time preview map if you don’t mind a small performance hit. All the program’s windows can now be maximised. The canvas is now 2048 x 2048 pixels, and you can scroll around it by holding down the right mouse button and dragging the cursor. The app is smart enough to check for new versions too, so you’ll never be out-of-date. The HTML templates included with the executable allow you to customise the output. There are special tags embedded in the templates that you can move around to get the pages looking exactly how you want them to. I’ve got a very basic set of templates built into the program, so feel free to tweak. Version 2 is not compatible with maps made in versions prior to it. If enough people request it, I’ll code an import feature, but you should be able to manage. That, or you’ll explode. Please don’t though! A few features didn’t make it into this version: room linking being the major one. It’s next on the implementation list, as soon as I figure out a nice way of doing it. Special thanks to At-Will for providing me with some incentive. Considering the amount of work that’s gone into this, I’ve got it down as a beta. If you find any bugs or have suggestions, please post them in the CrawlNotes forum. ~ by Logan on January 16, 2009. Hm. Coolies. I’ll be downloading CrawlNotes this evening and giving it a go. Mind if I blog about it later on? Hey, this looks pretty cool. Can’t wait to play around with it a bit. @RPG Ike: Not at all! Well, I’ve got something to toy with this weekend. Thanks for making this available! You are a busy busy programming monkey! Nice work! The features sound really great and it is probably what I was hoping for for a very long time. I can’t wait to see the final version of it. how do i save? I keep getting error messages when i try to use the save button.